Please watch videos from Taylor Nicole Dean, Emzotic, Creative Pet Keeping, Chuck Horne, ParrotsRUs and more. Get creative enclosure setup ideas and helpful tips on assembly, animal care, etc. We update our videos often, so please check back for more. Our custom made build to order Hybrid Bird Cages, Reptile Cages and Small Animal Cages are all custom tailored for your specific needs. Stackable, expandable, and easy to assemble, our aluminum framed Hybrid reptile tanks and bird cages are safe, secure and made in the USA. With our one of a kind Hybrid Custom Cage Configurator, you can custom build and order your dream custom enclosures online! These beautiful furniture style bird cages and reptile cages make amazing setups for your pets and are a great addition to any home! We offer a vast selection of custom cage designs and reptile tanks such as corner cages, coffee table cages, and more! We have our own proprietary design featuring a solid Oak exterior and aluminum lined interior with the largest selection of custom cage options available making our line of designer custom enclosures not only beautiful but functional. Our aluminum frame also guarantees against wood chewing from the inside in bird cages, and protects from moisture in reptile tanks! Made in the USA! These huge powder coated indoor and outdoor aviaries are walk in friendly, weather resistant and easy to assemble! Safety catches allow access to your birds without fear of escape and allow you to connect multiple units together. Our SunCATcher cat cages and cat condos gives outdoor freedom to indoor cats! You and your pets can bask together in the sun on your patio without fear of escape or danger from predators, and with plenty of room to play and explore the great outdoors! If your budget is under $500, please click on any of the link above to select from a wide selection of bird cages. Our low dollar web site features an exclusive 150% low price guarantee as well as independent testing for lead and zinc! 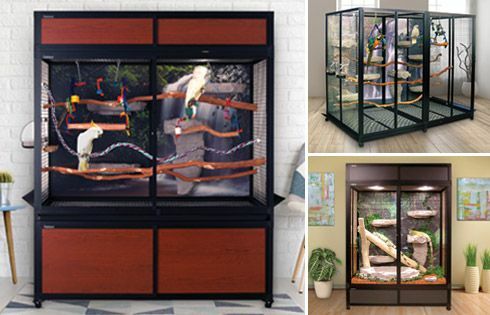 We carry dometop bird cages, play top bird cages, corner bird cages, bird cages with pull out floors and trays and even multi-unit bird cages! Choose from hundreds of custom cages and custom enclosures in this price range! We also make versatile, stackable reptile, rodent, mammal, and snake cages, racks, tubs, and bowls. Our sister company Vision Racks & Cages manufactures snake cages, racks and tubs that come in many sizes for breeding purposes. They are easy to maintain and come with built-in ventilation, so your snakes and other reptiles, mammals, or rodents have the proper breeding environment. These stackable racks and cages are truly the best reptile breeding systems available. You just bought a big cage with lots of space, why not use it? Our line of Replica furniture is molded from natural objects with high density expanded polyurethane making them look very realistic, resistant to harboring bacteria and insects, and easy to disinfect. We also designed these products to be strong enough to hold extremely large animals, yet much lighter than natural objects. They make the perfect solution for most habitats. Our premium replica reptile cage furniture has an even more detailed, realistic look than our standard replica cage furniture. This line includes a variety of reptile / snake bowls and shelves. These accessories help complete any cage with functional realistic rock structures. The material used for the snake bowls and shelves is strong, durable, and easy to clean. All of the snake bowls and furniture are designed to be difficult for a snake or other animal to tip over, so the food or water stays in the bowl and does not soil the bedding. Several of the premium snake bowls are low enough be used in the shortest cages. Whether your pet needs a food dish, water dish, bath, secure hiding place, or a combination, our premium replica furniture are the perfect accessory. We also make aquariums! Our sister company CustomAquariums.com manufactures glass custom aquariums of many shapes and sizes. Free delivery to your curb nationwide! Sliding doors also available making them great reptile and small animal cages. Also featuring amphibious tanks and half aquariums with sliding front doors - and they hold water! "I LOVE you, my birds LOVE you, we LOVE the cage and I LOVE CagesByDesign!!!" Click here to read more of our great customer testimonials. As a family owned and operated business, we put a lot of personal dedication and pride into our custom enclosures and accessories and are proud that our customers world wide can have the ability to create the ultimate habitat for their pets. Most of our aluminum and stainless steel materials are made in the USA as well as our cages, with materials bought from many suppliers close to our facility in northern Wisconsin. Since 1998 we have worked tirelessly to design, modify and re-design our custom cage system. We have used over a dozen engineers, tested countless prototypes and materials, used computer generated strength analysis, and spent thousands of hours on our design to ensure it has the proper strength, durability and functionality. We have proprietary patents, we invented our bird and reptile cage design, we own the tooling, and nobody else can copy our custom cage design. Trusted by Jack Hanna, used on Extreme Home Makeover, Pimp My Ride, by Humane Societies nationwide and the Make-a-Wish foundation on multiple occasions, Custom Cages is trusted by and has sold more build-to-order bird, reptile tanks and small animal custom cages sold than anyone, anywhere! Following is free bird information regarding the care of birds. You may publish these articles free of charge. Read here for more details.